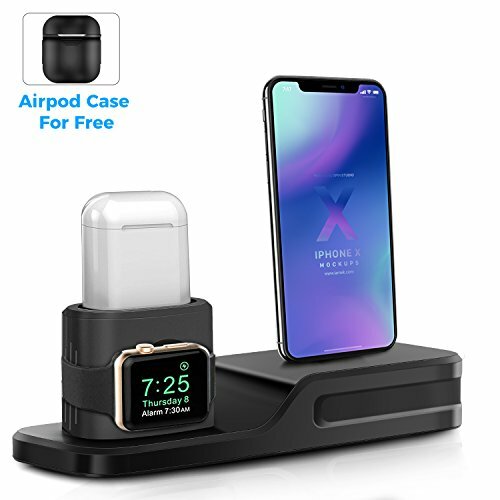 Derhom 3in1 Apple Watch Stand - Best Gift For your Apple Product. Made of non-toxic silicone material, solved the problem of scratching your Apple Watch and iPhone due to aluminum material. Works with all Apple Watch Series, Apple Airpods, and iPhone X, 8, 8 Plus, 7, 7 Plus, 6S, 6S Plus, 6, 6 Plus etc. The airpod silicone case prevent your airpods was scratches, scrapes and bumps. Precise cutouts for easy access to the charging port. •This product does not including cables,watch adaptor and devices. •Please feel free to contact us if any problems, our customer service team is always standby. If you have any questions about this product by Derhom, contact us by completing and submitting the form below. If you are looking for a specif part number, please include it with your message.